The FROM clause specifies the documents to be used as the input for a query. The FROM clause is used within a SELECT query or subquery. It specifies the documents to be used as the input for a query. 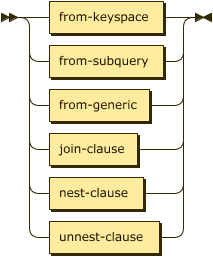 The JOIN clause, NEST clause, and UNNEST clause each contain a recursive FROM term. This enables you to chain JOIN clauses, NEST clauses, and UNNEST clauses together with each other, or with another type of FROM term. When the FROM term is an expression, USE KEYS or USE INDEX clauses are not allowed. The FROM keyspace specifies a keyspace to query from: either a specific bucket or a constant expression. (Optional) The name or identifier of the namespace of the data source. (Required) The name or identifier of the keyspace of the data source. The namespace and keyspace identifiers are not dependent on any of the variables in scope of a subquery. Assigns another name to the FROM keyspace. For details, see AS Clause. Assigning an alias is optional for the FROM keyspace. If you assign an alias to the FROM keyspace, the AS keyword may be omitted. Enables you to specify that the query should use particular keys, or a particular index. For details, see USE clause. The simplest type of FROM keyspace clause specifies a single bucket. Specifies a N1QL SELECT expression of input objects. Use parentheses to specify a subquery. For more details and examples, see SELECT Clause and Subqueries. Assigns another name to the subquery. For details, see AS Clause. Assigning an alias is required for subqueries in the FROM term. However, when you assign an alias to the subquery, the AS keyword may be omitted. Example 2. A SELECT clause inside a FROM clause. For each country, find the number of airports at different altitudes and their corresponding cities. Couchbase Server version 4.6.2 added support for generic expressions in the FROM term; and this adds huge flexibility by the enabling of various N1QL functions, operators, path expressions, language constructs on constant expressions, variables, and subqueries to create just about any FROM clause imaginable. Assigns another name to the generic expression. For details, see AS Clause. Assigning an alias is optional for generic expressions in the FROM term. However, when you assign an alias to the expression, the AS keyword is required. The expression may include JSON scalar values, static JSON literals, objects, or N1QL functions. The expression may refer to any variables in scope for the query. To use a shorter or clearer name anywhere in the query, like SQL, N1QL allows you to assign an alias to any FROM term in the FROM clause. The AS keyword is required when assigning an alias to a generic expression. The AS keyword is optional when assigning an alias to the FROM keyspace, a subquery, the JOIN clause, the NEST clause, or the UNNEST clause. String to assign an alias. The following FROM clauses are equivalent, with and without the AS keyword.